Product #16828 | SKU UTXP03CE42 | 0.0 (no ratings yet) Thanks for your rating! 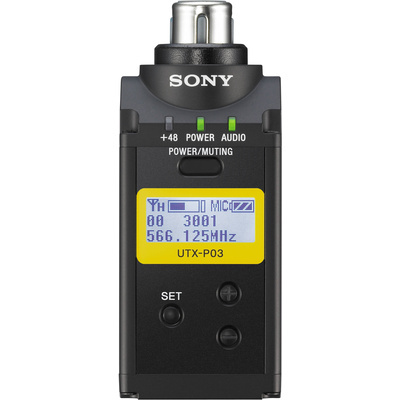 The 638 to 698 MHz version of the Sony UTX-P03 Integrated Digital Wireless Plug-On Transmitter features an all-metal chassis, an easy to read LCD display, a wide switching RF bandwidth, USB power and charging options, automatic channel scanning, infrared synchronisation between transmitter and receiver, a Mic/Line switchable input, +48V phantom power, and digital companding circuitry. The transmitter is suitable for a wide range of wireless applications such as ENG (Electronic News Gathering), documentary work, talk shows, conferences, and more. The transmitter is referred to as integrated digital because it utilises DSP for digital companding and expanding of the transmission signal. Performing the companding and expanding processes in the digital domain improves the accuracy and transient response of the received audio. The system utilises UHF Phase Locked Loop (PLL) synthesis to lock the phase of the transmission frequency between transmitter and receiver. The receiver can automatically search for an available transmission frequency and link the desired frequency to the transmitter via infrared connection. An LCD display provides channel AND frequency information, battery life, RF-input level, audio-output status and accumulated operating time. For power, the transmitter operates on two AA batteries for up to six hours, or on 5 VDC of USB power over a USB micro B cable. The USB connection can also be used to recharge Ni-MH rechargeable batteries within the battery cartridge. The transmitter features a mic- and line-level switch for standard wired microphone- or line-level sources. The plug-on transmitter also features selectable +48V of phantom power for connection to a condenser microphone. Selectable transmission output power provides a choice between 5mW output, which is suitable for simultaneous multi-channel operation, or 30mW output for long distance transmission. The transmitter comes with a soft case.